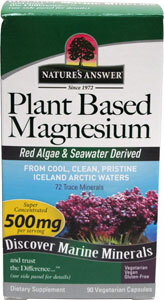 Harvested in the cool, clean and pristine waters off the coast of Iceland, the red algae and sea water used to create Nature's Answer Plant Based Magnesium are ensured to be as pure as you can find in nature to give you the highest quality supplement available. Marine vegetation is richer in minerals than vegetation that grows on land, and the unique cell structure of these sea minerals gives them significant benefits for optimal absorption to maximize effectiveness in the body. Each 90 capsule bottle contains 45 servings at the recommended dosage of 2 capsules per serving, with each serving providing 500mg of Magnesium and 25mg of Calcium. $12.99 per bottle.